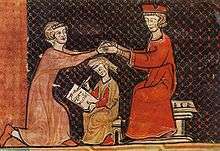 Homage in the Middle Ages was the ceremony in which a feudal tenant or vassal pledged reverence and submission to his feudal lord, receiving in exchange the symbolic title to his new position (investiture). It was a symbolic acknowledgement to the lord that the vassal was, literally, his man (homme). The oath known as "fealty" implied lesser obligations than did "homage". Further, one could swear "fealty" to many different overlords with respect to different land holdings, but "homage" could only be performed to a single liege, as one could not be "his man" (i.e., committed to military service) to more than one "liege lord". A similar concept is the Islamic oath, Bay'ah. There have been some conflicts about obligations of homage in history. For example, the Angevin monarchs of England were sovereign in England, i.e., they had no duty of homage regarding those holdings; but they were not sovereign regarding their French holdings. So Henry II was king of England, but he was merely Duke of the Normans and Angevins and Lord of Aquitaine. The Capetian kings in Paris, though weak militarily, claimed a right of homage. The usual oath was therefore modified by Henry to add the qualification "for the lands I hold overseas." The implication was that no "knights service" was owed for the conquered English lands. Wikimedia Commons has media related to Hommage.